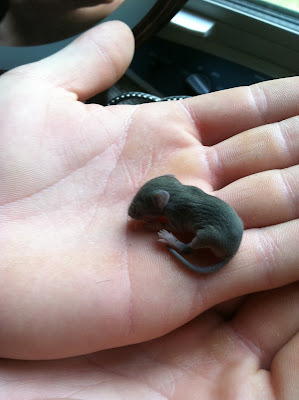 Baby mice...my daughter's fiance found them in the shoppe vac that was in the garage...We left them alone, outside the vac and he thinks the mother mouse came back for them. I just want to say that I am terribly sorry for all the people effected by the tornadoes and floods in the Midwest. This is just horrible and my thoughts and prayers continue to be with you. Oh my stars!! They're adorable!! Awwww they are! How tiny!! Yay that mama mouse returned for them - awwwww!!! They're so cute! I like mice and moles, even bats. I really do hope the mom returned for them. We're purring and purraying for all those affected too. Those itty bitty baby mice are so cute! We think they are so cute, but the Momster is all squirmy here. The storm in Joplin is horrible, about 150 miles from us. Such utter devastation and such sad loss of life. Add us to your thoughts and prayers, we are under the gun for tomorrow and Wednesday. 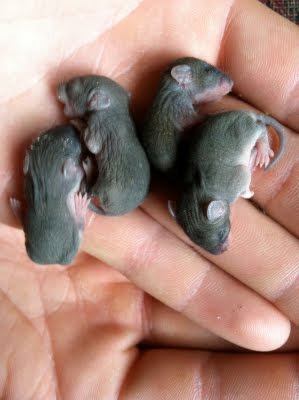 I think these little babies are adorable - no matter if they are considered a pest or not - they are sweet to me. My prayers go out to the folks affected by the tornadoes. That is so scary! Our thoughts are with everyone effected by the tornadoes. eeeeeeek - our mom is screaming and running! they are adorable little pests. i am with you on the tornado victims, i cried this morning watching CNN, there are two missing babies torn from their mothers arms. Oh my goodness, they are so cute. I'm glad to hear Mama Mouse came back for her little ones. It is terrible about the tornadoes and floods in the Midwest. It breaks my heart to watch the stories coming out of the area. Oh wow, how cute and small. Almost look fake! My son (2 yrs old) is now in love and begging for "babay meece" LOL. No one likes mice, but their mommies do! I myself think these babies are adorable!! !